History might judge the Paris climate agreement to be a watershed for all humanity. If nations succeed in halting runaway climate change, this will have enormous positive implications for life on Earth. Yet as the world applauds a momentous shift toward carbon neutrality and hope for species threatened by climate change, we can’t ignore the even bigger threats to the world’s wildlife and ecosystems. Climate change threatens 19% of globally threatened and near-threatened species – including Australia’s critically endangered mountain pygmy possum and the southern corroboree frog. It’s a serious conservation issue. Yet our new study, published in Nature, shows that by far the largest current hazards to biodiversity are overexploitation and agriculture. We assessed nearly 9,000 species listed on the International Union for the Conservation of Nature’s Red List of Threatened Species. We found that 72% are threatened by overexploitation and 62% by agriculture. Overexploitation (the unsustainable harvest of species from the wild) is putting more species on an extinction pathway than any other threat. And the expansion and intensification of agriculture (the production of food, fodder, fibre and fuel crops; livestock; aquaculture; and the cultivation of trees) is the second-largest driver of biodiversity loss. Hunting and gathering is a threat to more than 1,600 species, including many large carnivores such as tigers and snow leopards. Unsustainable logging is driving the decline of more than 4,000 species, such as Australia’s Leadbeater’s possum, while more than 1,000 species, including southern bluefin tuna, are losing out to excessive fishing pressure. Land change for crop farming and timber plantations imperils more than 5,300 species, such as the far eastern curlew, while the northern hairy-nosed wombat is one of more than 2,400 species affected by livestock farming and aquaculture. The threat information used to inform our study is the most comprehensive available. But it doesn’t tell the complete story. Threats are likely to change in the future. Climate change, for example, will become increasingly problematic for many species in coming decades. Moreover, threats to biodiversity rarely operate in isolation. More than 80% of the species we assessed are facing more than one major threat. Through threat interactions, smaller threats can indirectly drive extinction risk. Roads and energy production, for example, are known to facilitate the emergence of overexploitation, land modification and habitat loss. But until we have a better understanding of how threats interact, a pragmatic course of action is to limit those impacts that are currently harming the most species. By ensuring that major threats that occur today (overexploitation, agriculture and so on) do not compromise ecosystems tomorrow, we can help to ameliorate the challenges presented by impending climate change. 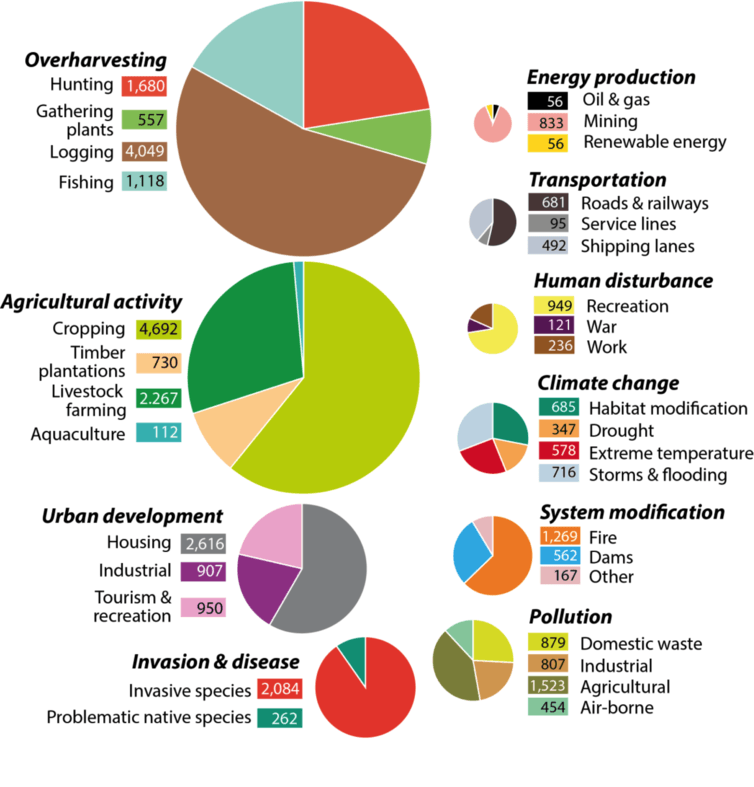 Overexploitation and agriculture demand a variety of conservation approaches. Traditional approaches, such as well-placed protected areas and the enforcement of hunting, logging and fishing regulations, remain the strongest defence against the ravages of guns, nets and bulldozers. Achieving a truly effective protected area network is impossible, however, when governments insist on relegating protected areas to “residual” places – those with least promise for commercial uses. Reducing impacts from overexploitation of forests and fish is also futile unless industries that employ clearfell logging and illegal fishing vessels transition to more environmentally sustainable practices. Just as critical as traditional approaches are incentives for hunters, fishers and farmers to conserve threatened species outside designated conservation areas. 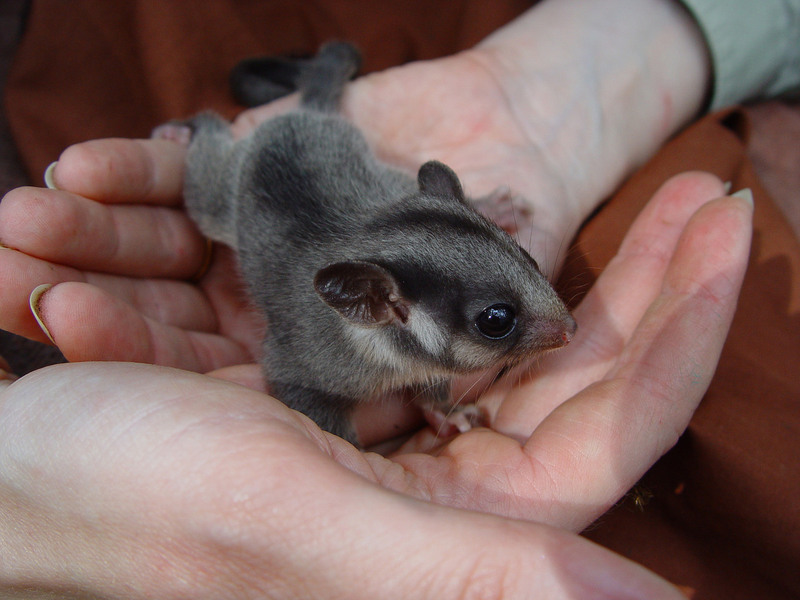 Australia’s Leadbeater’s possum remains threatened by logging. For nations like Australia, our study shows there is a growing mismatch in environmental policy and the outcomes for biodiversity. Environmental programs such as the once well-funded National Reserve System Strategy and Biodiversity Fund were important in that they helped conserve wildlife on private and public land, and were fundamental to defeating the biggest, prevailing threats to Australia’s biodiversity. But these programs either do not exist anymore or have little funding to support them at state and federal levels. On top of this, land-clearing – without doubt one of the largest threats to biodiversity across the country – is on the increase because laws have been repealed across the country. 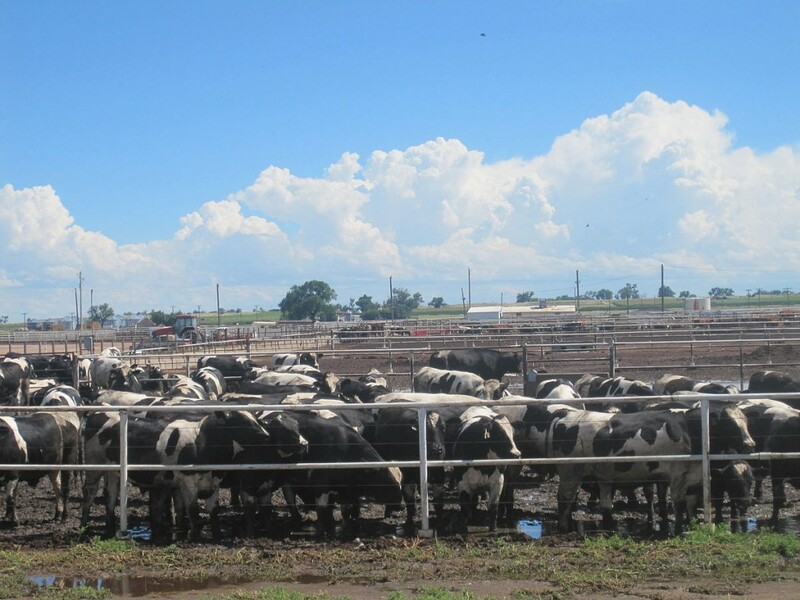 Any benefits accrued by previous good environmental programs are being eroded. If we are to seriously tackle the largest threats to biodiversity in Australia, we need to recognise the biggest threats. This means efforts to reduce threats from agriculture and overexploitation of forests and fish must include durable environmental regulation. This article was co-authored by Thomas Brooks, head of science and knowledge at the International Union for the Conservation of Nature. Sean Maxwell is a PhD candidate, The University of Queensland; James Watson is Associate professor, The University of Queensland, and Richard Fuller is Associate professor, The University of Queensland. This article was originally published on The Conversation. Read the original article.